Charles Danner started making boots in Wisconsin way back in 1932. A long time ago. Shortly after though, he moved his operation to a factory out in Oregon, based on a demand for logging boots in the Pacific Northwest, and they're still at it today. Recently, I was in Portland of the first time and visited the factory where Danner produces much of their footwear to this day, including the entire Portland Selects line. The factory itself was humming when I visited. Loud, busy, productive. It’s a site that can honestly be a bit overwhelming for someone who sits at a computer most of the day. The scene entirety of the scene is something that is sort of lost in these pictures. Out of respect for Danner’s employees, they were only photographed after giving permission, meaning I took a lot of empty factory floor shots. Danner does brisk business outfitting our armed service members with made in USA product, so along with the Portland Selects and the other boots most of us civilians recognize as quintessential “Danner” (big tongues and treads, red laces), the craftsmen and women on the floor were also busy producing a lot of military boots. And by a lot, I mean A LOT. We started our tour at the beginning of the factory floor, where racks and racks of leather are inspected and cut by master cutters. It was onto sewing the uppers, making the lowers, adding the hardware, stretching the pieces onto a form, and eventually attaching the boot’s sole. That’s an abbreviated version of the process of course. 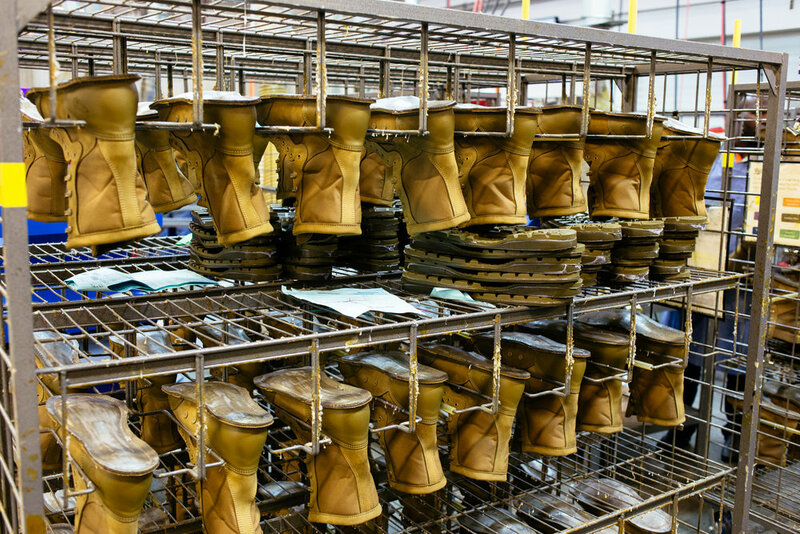 Anyone who has dipped into a boot factory knows there’s a lot more to it than that. Suffice it to say the level of mastery that goes into one pair of boots is really remarkable. 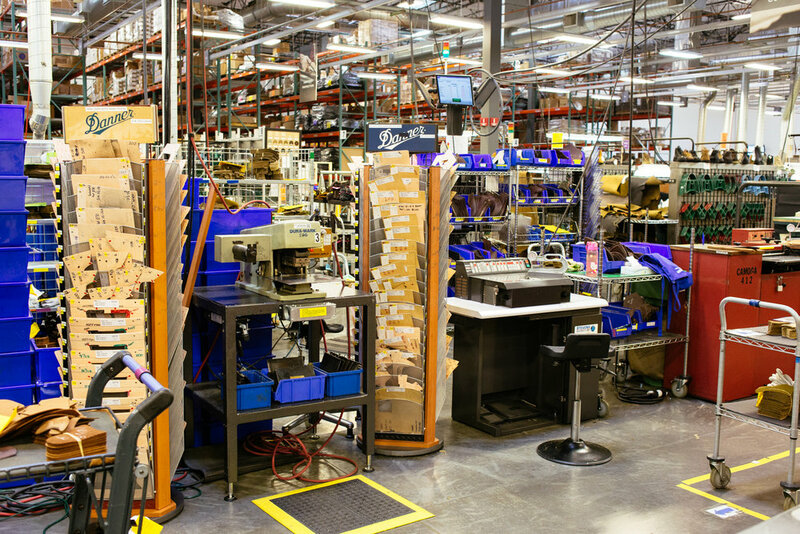 Dozens of skilled craftsmen with specialized machines “touch” each pair of boots before they are ready to slide down ramp, get packaged up, head out the door and spend a lifetime on someone's feet.